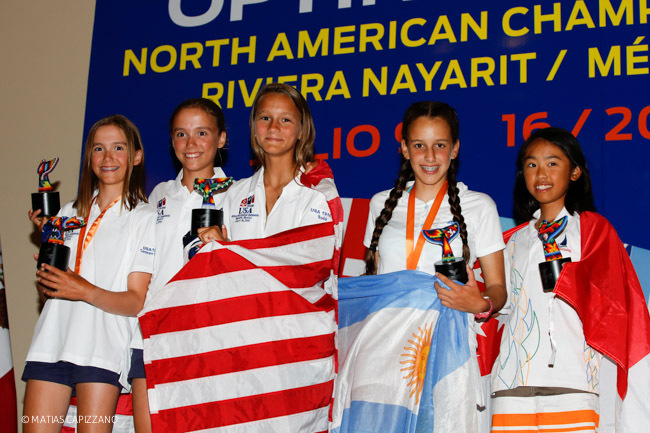 NUEVO VALLARTA, Nayarit – More than 175 young sailors participated in the 10th and final race of the 2014 North American Optimist Sailing Championship in July at Vallarta Yacht Club. After the race, all participants gathered at the Paradise Village Convention Center for the Awards ceremony where Regatta Chairperson, Linda Green, led opening remarks along with representatives of the International Optimist Class Association and the Mexican Sailing Federation. Vallata YC Director of Afloat activities and scorer, Andy Barrow announced the sailor’s names as they arrived at the podium to receive a 2014 Optinam medal. Singapore won the Open Nations Cup with USA being awarded the North American Cup. Individual awards were presented to the top 15 contenders and to the top five Best Placed Females of the open championship. Singapore’s Jodie Lin led in both categories. The USA swept the three best places of North American with Ival Shestopalov being named the 2014 North American Champion. Final results are: 1st place, Jodie Lin or Singapore; 2nd place, Ivan Shestopalov, USA; 3rd place, Benjamin Fuensalida, Chile; 4th place, Ryan Kwok, Singapore, and 5th place, Luke Arnone, USA. Final results can be found at optinam2014.org/results-display/results-display.